Ulster Folk & Transport Museum, Cultra, Ulster. 1984. Henry George “Harry” Ferguson was born in 1884 at Growell, near Dromore, County Down. The son of Mary and James was the 4th child of 11 in the family. In 1902 he became an apprentice in his elder brother Joe’s engineering business, Hamilton and Ferguson – later to become J.B. Ferguson and Co. Automobile Engineers based in Little Donegall Street in Belfast. The brothers were known for their discipline, efficiency, accuracy and quality. Great innovators, they used the most up-to-date equipment. Harry also took part in sporting events to publicise the company. In 1933 Ferguson designed the revolutionary ‘Black Tractor,’ which was both light and powerful. It was built in Huddersfield, West Yorkshire, by David Brown Tractors Limited. The Ferguson Brown Type A was introduced in 1936. Sales were slow – but some success was to be found in the Channel Islands and Scandinavia. Later on (in 1938) Ferguson met Henry Ford and – famously sealing the deal with a handshake – agreed to go into business together. The equally famous Ford Ferguson Tractor was born and thousands were built (in the Ford factory in Detroit, Michigan) up until 1947. Ferguson switched production to Coventry in the East Midlands and in 1946 the TE 20 made an appearance. 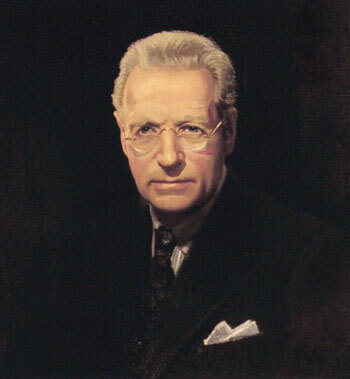 He later became involved with the Canadian-based Massey Harris (later known as Massey Ferguson) until 1954 when he resigned as chairman of the group. Whilst his name is – rightly – most commonly associated with tractors, Ferguson had always retained his interest in motor cars. He was successful in helping to launch the Ulster Grand Prix in 1922 and the Tourist Trophy Races in Ards between 1928 and 1936. He also became interested in the idea of cars obtaining more power safely using a four-wheel-drive system. Prototypes were built but there were no takers. To try to encourage public acceptance of the system, the P99 racing car was built. (Stirling Moss gave the car its first win, the Oulton Park Gold Cup in 1962.) The system was later used in the Jensen Interceptor FF, a luxury car, but sadly never in a ‘people’s car’ as he wished. Ferguson sadly died in October 1960.